"I write this letter in deep appreciation for the work and commitment of Jasmine Lok and Ali Kishiyama. My family and I have been residents of Lyons for 7 years. There are so many aspects of Lyons that keep us here and top on our list of reasons is Mayama Studio. We utilize the excellent classes for both myself, attending Nia 3 times per week, and for my 6 year old son, who loves the breakdancing and can't wait for the Fall season to start. The classes have meant so much to us and have contributed greatly to our enjoyment, sense of community, health and self-esteem. The quality and commitment of the teachers at Mayama clearly stand far above other dance studios that I have participated in. A day does not go by that my son and his 2 year old brother aren't watching a video of his Mayama breakdancing recital and practicing their moves together. Mayama has been an incredibly positive influence on both of my sons and has given them passion for dance at a very early age. What a gift!" "I've been taking a restorative yoga class with Lisa Limoge for two years at Mayama and am so grateful that both are in my life. Lisa's class is the perfect blend of conditioning and relaxation to help me keep up with my busy life. Lisa is always attuned to her students' needs, helping each attain the goals they desire. Mayama makes taking classes easy with their various payment methods and accessible studio location. Thank you Lisa and Mayama for two great years of yoga--and more to come!" "One of my favorite quotes reads: “If you can talk you can sing, and if you can walk you can dance.” - Zimbabwe. At Mayama it is believed that anyone, no matter his or her shape, height, or size can dance. Dancing is more than just an action, it is a feeling. But it takes a little more than just a few plies at the ballet barre to feel it; it takes determination, discipline, and most of all, love. Mayama offers these building blocks to anyone who wants to feel the music, and the extra push for those who want to take their dancing to another level. I look forward to going to the studio every day, to feel the floor beneath my feet, and the music through my body. We all have a place we like to call our home, somewhere we feel grounded, supported, loved, and comfortable. 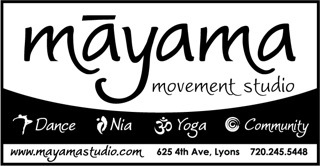 For me, I am proud to call Mayama Movement Studio my second home. Here I find the perfect balance of support, challenge, and love from my instructors, mentors and teammates. Mayama has given me direction, purpose and continues to fuel my love for dance every day." I write this letter to let you know how important the Nia Dance class is to me. I moved to Lyons just a year ago after retiring from my position as an elementary school principal in Seattle. Although I loved my work, it was a very stressful job with little time for myself. When I finally moved to my new home in Lyons, I was exhausted and ready for new adventures that would renew my spirit and help me find myself again. Some ladies in town invited me to your class and assured me I would have fun and truly enjoy myself. I was a little skeptical because I had not done any kind of dancing for many years. But I was ready to find a new me! From the first class when you invited me just to have fun and enjoy myself I knew I had found something I was going to like. Although in good health, I was stiff and had poor balance and flexibility. My first attempts at moving my body were pretty stiff and awkward. I wondered if I was possibly too old to do this! You had us shaking our booty and twirling around the room to music that actually made me giggle. Do you know how long it had been since I had twirled around a room - giggling? Since I was a teenager? Maybe a little girl? I noticed that the other ladies were having the same wonderful time! I started the class last November and have made it a priority ever since. I love that you always encourage us to have fun, seek joy and love, and make it our individual dance. Nia has changed how I move, how I think about myself, and I have gained a renewed joy in life. I love the ladies I've met and I appreciate the way you help us embrace and celebrate ourselves - and one another. Your class is far more than a dance class! "Mayama is a huge hit in our small town, where kids' favorite after school activity is dancing! These teachers are wonderful role models and I am so pleased to see so many boys involved. Mayama's spring recital is nothing less than outstanding, complete with make-up and costumes and the thrill of being on stage in front of an audience. For both my son and daughter, dancing has become part of their identity; a belief in themselves that they will carry forever. Thank you, Mayama!" "I have been attending classes at the Mayama studio for about two years, especially Nia, Zumba, and Yoga. These classes have made a difference in my life, encouraging me to move in ways that are enjoyable and good for my body. The classes also help me to center spiritually, and remind us to have compassion not only for others, but for ourselves. Mayama is also where we meet new and old friends, and informally share community projects; we learn what is happening in our community and can think about what we can all do to to help improve Lyons." "Mayama has given my daughters the gift of dance and the feeling of community. Because we live in a small town, there are lots of things that we don't do because it would require a commitment to get in the car and drive. We are so glad that being part of a top-notch dance program is something my daughters can do easily in Lyons. Mayama seems to take seriously two things: having fun and becoming a great dancer. This is clear at the end of classes, when we pick up our kids and get to watch them perform what they've worked on that day...when they get to show their skills to the community at the Halloween Parade, the Winter Parade, Lyons school talent shows, Lyons Good Ol' Days.... when the year culminates at their incredible recital in the spring. The music, costumes and choreography that they thoughtfully select for each group repeatedly amaze us all. Thank you, Mayama!"